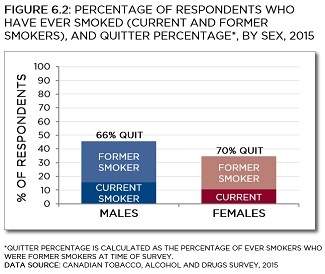 In 2015, quitter percentages among males (65.8%) and females(70.1%) did not differ significantly.47 However, a greater percentage of males had ever smoked,48 and were current smokers49 (Figure 6.2). 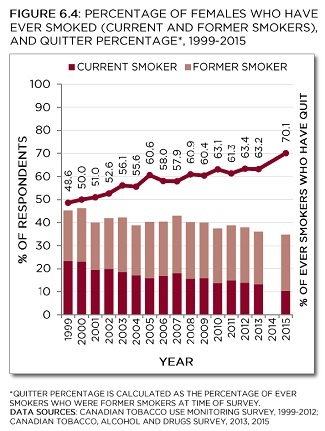 Since 1999, similar patterns have been observed; while male smoking rates (both current and ever) were higher, similar percentages of both male and female ever-smokers had quit (Figure 6.3; Figure 6.4). 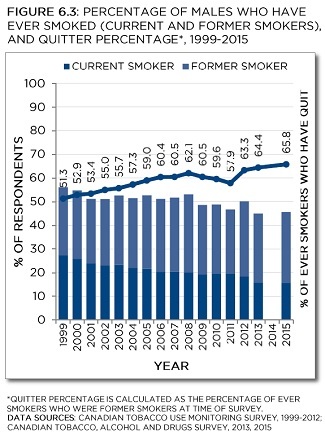 Among males, quitter percentage rose steadily until the mid-2000s, but then changed very little until again increasing the most recent few years (Figure 6.3). Quitter percentage among females appears to have risen fairly steadily since 1999 (Figure 6.4). Data source: Canadian Tobacco, Alcohol and Drugs Survey, 2015. Data source: Canadian Tobacco Use Monitoring Survey, 1999-2012; Canadian Tobacco, Alcohol and Drugs Survey, 2013, 2015.